I love dim sum, who doesn't? It's always an easy choice for a weekend brunch. I've been trying to find a good dim sum place now that we are a few thousand miles from Marigold, my favourite yumcha restaurant in Sydney, which boasts of 100 plus varieties of dim sum every day. The Tung Lok restaurant at Paramount hotel, despite bearing the Tung Lok brand name, is extremely disappointing in terms of quality and the abysmal variety. Wah Lok in Carlton hotel is a perennial favourite, its standards are consistent throughout the years. We went to Crystal Jade at Changi Airport last weekend for the reason that it would probably not be too crowded and was fairly near to us. 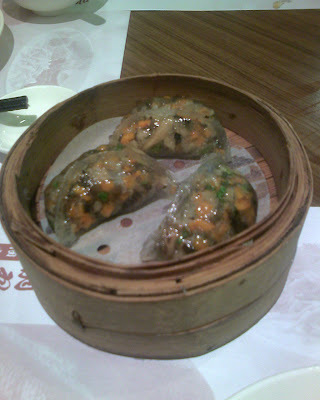 It was pretty good and in particular, this steamer of transparent-skinned veggie dumplings. Visually pleasing and tasty. This Crystal Jade is definitely on our list for yumcha. After that, we decided that we were finally hungry and so I led the way to the famous Komalas Villas, the original one and not the fast-food version we saw next to Mustafa. I ordered the masala dhosai which had potatoes in it, G got something which looked like a pizza with tomatoes on, but is probably some sort of roti with tomatoes and P got the onion dhosai. We each got a mango lassi as well and it was a cheap and yummy dinner. And filling too even though it didn't look very big. P and I did what the Romans do, and used our hands while G chickened out and went with his fork and spoon. The dhosai was incredibly cheap at $2.50 or so. The lassi cost almost as much. The guys then each had a masala tea after the meal. I was too full by then. They were very sceptical when I told them that the additional receptacle that came with the stainless steel cup of tea was for them to transfer the tea to back and forth to cool it. But they tried the tea-cooling technique. After dinner, we had a wander around the neighbourhood. 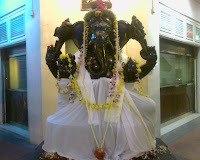 The Ganesha statue attracted my attention. It was part of a touristy-looking Indian/Chinese restaurant. We won't be going there I'm sure, but the decor was attractive at least. 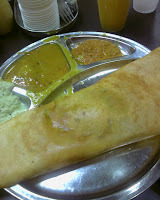 I'm going to be sticking with my $2.50 dhosai. I keep saying I am over the search for a good coffee in Singapore and I just shouldn't bother. It's all a waste of money ($5 at least) and suffering yet another disappointment. But sometimes I still cave in, like at the Society Cafe for a late Saturday lunch after yoga. We had walked past the joint a couple of times and had checked out the menu and spoken to a very friendly waitress the week before, so we thought we would give it a go this weekend. They actually knew what a flat white was, so that was an encouraging sign, however the fact that they didn't have soy milk quickly took them down a notch. But I thought I would risk the milk. 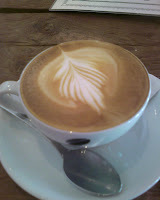 The coffee art came with a shaky hand and the cup was quite small, so there goes a few more points. And it was all down to the taste. Verdict: Not as watery as the other places, but not quite as flavoursome or thick enough for me. I would give it a 5 out of 10. 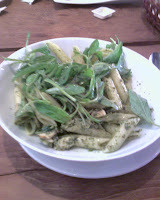 The chicken, spinach and pesto penne fared a lot better. It was not a huge portion but was just nice for me. We could all smell the fragrance of the basil pesto. A very promising sign. It was delicious, there were visible bits of chicken and I even crunched into a pine nut or two. And of course there was dessert. There were 2 cake stands staring directly at us the whole time. 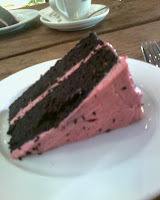 1 was a carrot cake with a delightful green tea frosting and the other was a chocolate beetroot cake with pink frosting. We decided to be adventurous and go for the chocolate-beetroot combo. It was moist and had a tinge of beetroot. 2 thumbs up! I would come back for the penne and the cake. And save my money by sticking to teh-c.